Do you ever feel like time is standing still when you walk through a snowy winter morning? It’s been just that kind of a dreamy time for F&M. It seems that December has sneaked up on us this year. So we thought we would dig into our past recordings and revive a very special release we did only on Bandcamp back in 2011. Look out for “Winter Is Coming: Songs of Winter and Christmas” later this week on Spotify and other streaming / purchasing services. We will be posting links soon. We have a very special performance coming up in Edmonton. 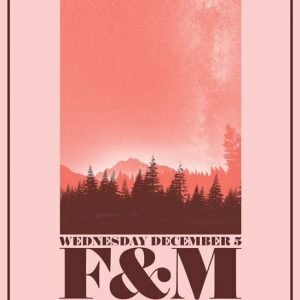 F&M will be performing an intimate wine evening at The Common on Wednesday, December 5th. The evening starts at 9 pm with the wonderfully beguiling Caity Fisher. Free cover and half price wine!